It is hard to believe another year has passed and that we stand on the precipice of another harvest. I probably say this every year, but where has the time gone? It seems like only yesterday we were putting the finishing touches on the wonderful 2016 vintage, now soundly ensconced in bottles or barrels. The 2017 season started off much differently than the last 3 years, with a deluge of rain. Most areas received significant precipitation, filling up reservoirs, creeks, and the soil profiles of our beautiful estate vineyards. This boost of available water, while desperately needed, has changed the nature of our Estate Viticulture team’s challenge this growing season. Higher water availability allows the very fastidious and efficient grape vine to focus additional energy on vegetative growth. The added leaves, shoots, and laterals make extra vineyard passes a necessity to allow for appropriate shoot selection, leafing, and suckering to prevent shading and ensure the proper balance of fruit to canopy. The additional photosynthetic machinery can also be a problem later in the season, driving excessive transpiration and sugar production, along with the potential for higher methoxypyrazine production (the chemical responsible for bell pepper taste in Bordeaux varietals). Needless to say, our Estate Team has met the challenge head on and the Estate vineyards have never looked better. 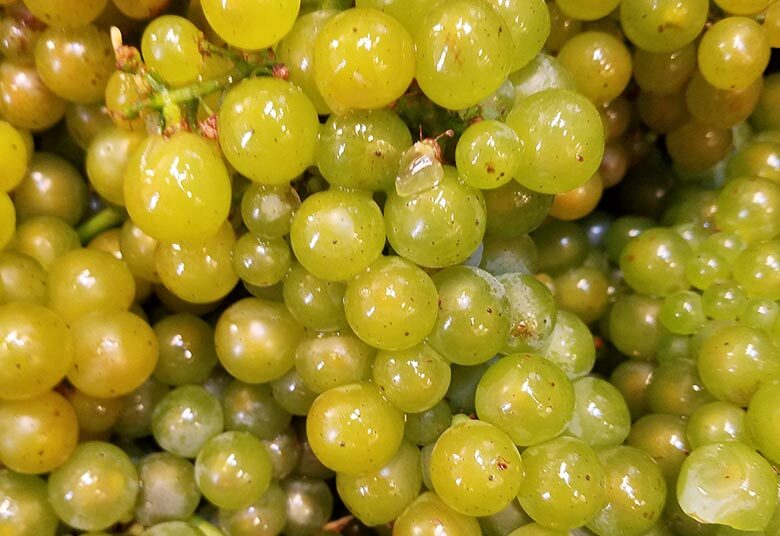 We have started our grape analysis, and all indications are that harvest will start in earnest sometime late next week, or early the week after with Sauvignon Blanc or Semillon for Duckhorn Vineyards. More to come in the days and weeks ahead! Our last day is in the beautiful town of Arles, home of the famous Van Gogh. Many might think that Paris is the largest city in France, but it is only by population, Arles is actually the largest city by area. One important note of this day that no picture could capture are the "mistrals". We woke up to essentially gale force winds that almost carried us away. These crazy winds (or mistrals) blow 250 days a year and start from the north in Lyon and move through southern Rhone. Local legend has it that if you commit murder of your husband or wife on days with heavy mistrals, you don't get prosecuted because they literally make you crazy. These "mistrals" also play an important role in regional wine and impact the overall terroir of the Rhone Valley. Hope to see you all on our next adventure! 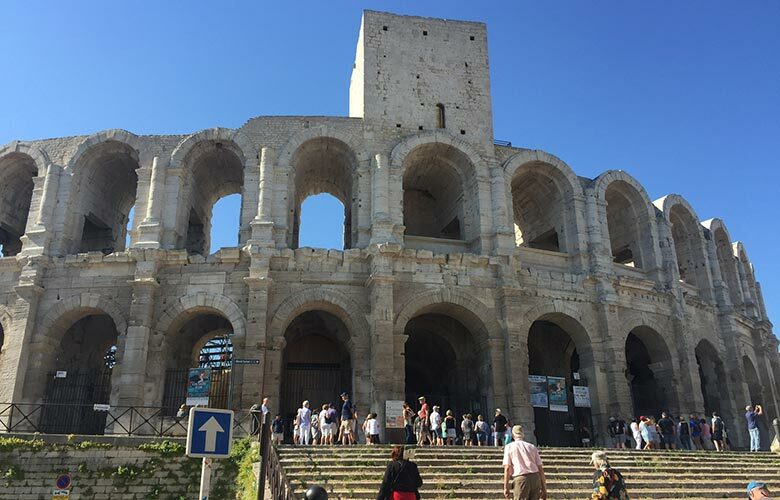 We have made it to Avignon, home of the "Palais des Papes" (Palace of the Popes). This gigantic fortress was actually home to many popes from 1378-1417 and is Europe's largest gothic palace. Did you know that there were actually two competing pope's during that time: one in Rome and one in Avignon? Finally, the Roman's won and Avignon eventually lost their papal status. In addition to the palace, the city is surrounded by a three-mile-long wall fortified with 39 towers and eight gates, which were built back in 1368 and still stand today. 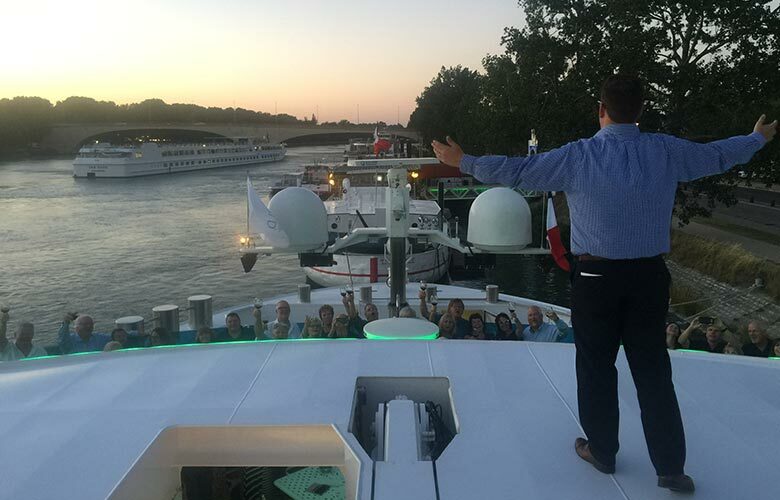 Here in Avignon, we are also home to one of Rhone's most famous wine appellations, Chateauneuf du Pape, which translates to "the Pope's new Castle". 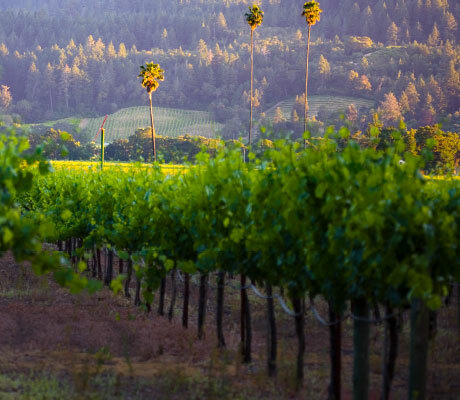 This prestigious wine region has many strict laws, including limited irrigation (they are only allowed to irrigate once a year and only if there is extreme heat). The wine is commonly blended with Syrah and Cinsault, though the most popular varietal used and highly celebrated is Grenache. 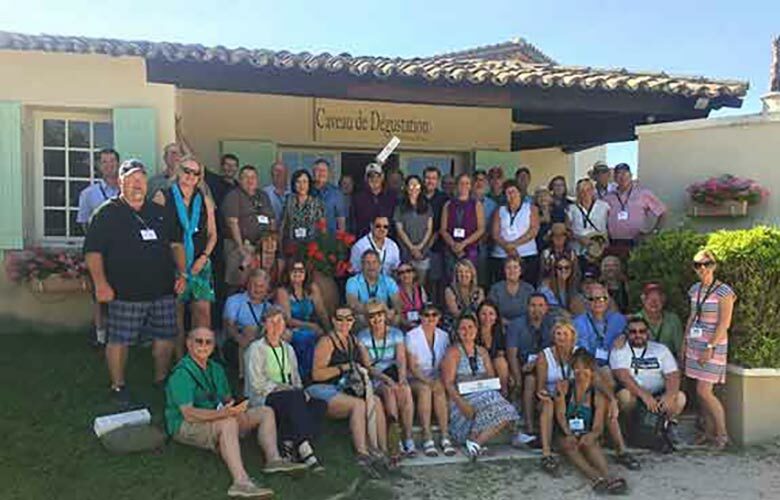 Some of our Rhone Quack Pack toured around this wine region to explore first hand what makes Chateauneuf du Pape so famous. 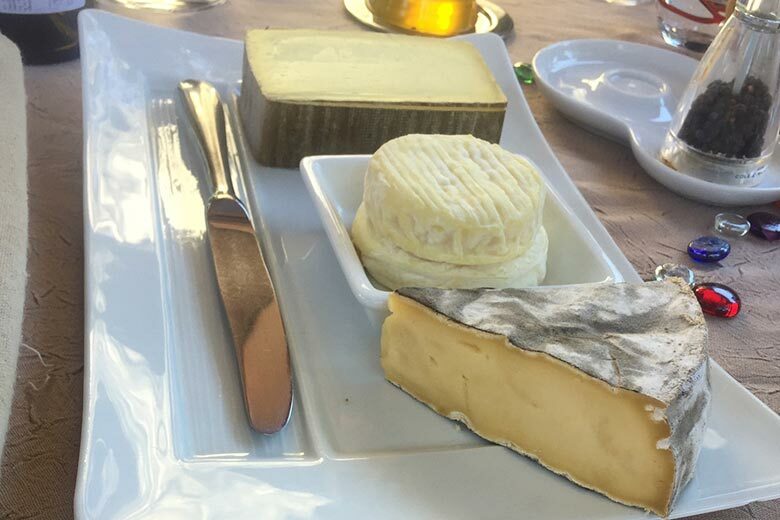 First, we dined al fresco at the chef-owned restaurant, La Table de Sorgues for lunch. We indulged in several courses, including chilled melon soup, Foie gras with wild mushrooms and shaved white truffles, roasted chicken, lemon macaroons with strawberry sorbet and homemade lavender marshmallows. Now it was time to drink! We were welcomed first to Domaine de la Janasse and tasted five wines, including a Rosé. However, the favorite amongst many was the Chateauneuf du Pape 'Vieilles Vignes' from 2015. Next up was Alain Jaume, where they have been making wines since 1826. The wines were intense, rich, complex, and beautifully reflected the unique terroir of southern Rhone. Back and the ship, we are docked right in front of the entrance to the city center. A giant ferries wheel, which I can see from my room, welcomes us each time we pass by. 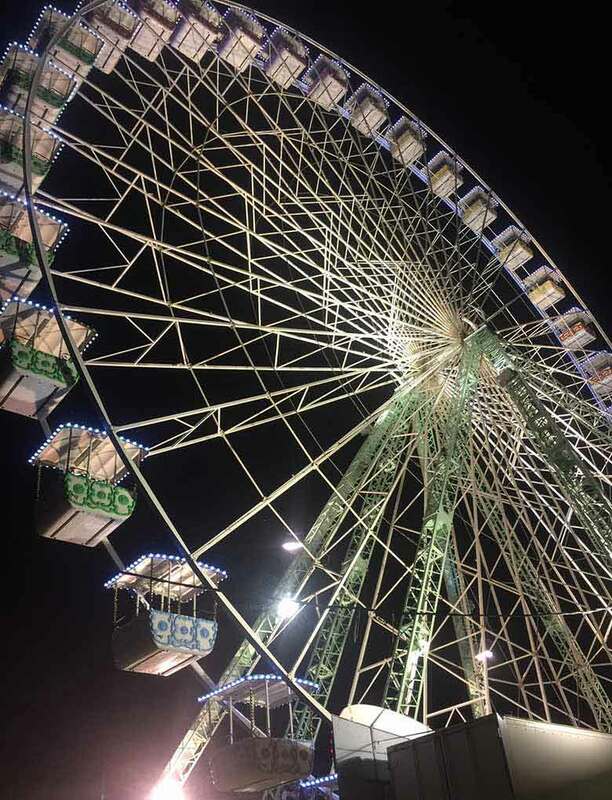 At night, it is a great way to see a different view of the city. Next up, the town of Tarascon and a tour of a local olive farm awaits! 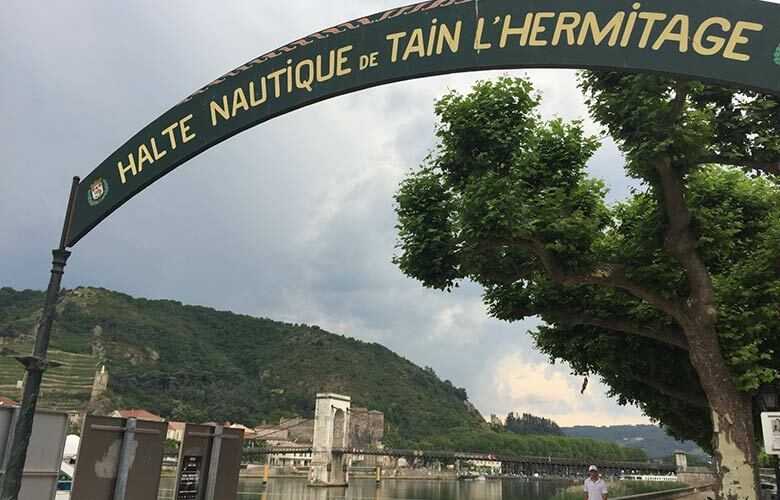 Two interesting Rhone towns sit facing each other with records dating back to the middle ages, Train L'Hermitage on the left back of the Rhone river and Tournon on the right. The two communities are competitive with one another and have been for many years. The Rhone separates them and their classes are divided. Every year they compete in a jousting competition on the river for bragging rights! 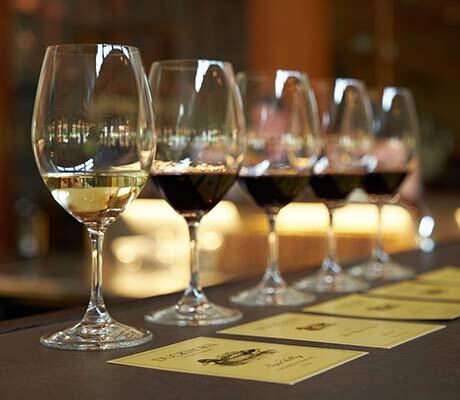 Both are renounced for their world famous wines, as they have ideal conditions of sunshine and rain. 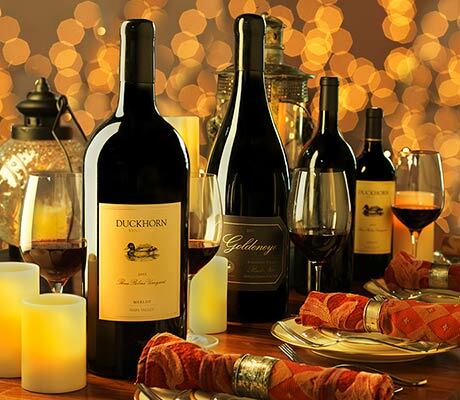 The red wine is made from the Syrah grape and gives it a distinctive concentrated rich purple color. The white wine is made from the Roussanne and Marsanne grapes. Some of the wines made here are aged not only in traditional French oak but also in cement tanks. As we watched the sunset between these two towns, we enjoyed a little bit of history of our own - Duckhorn Library Night! 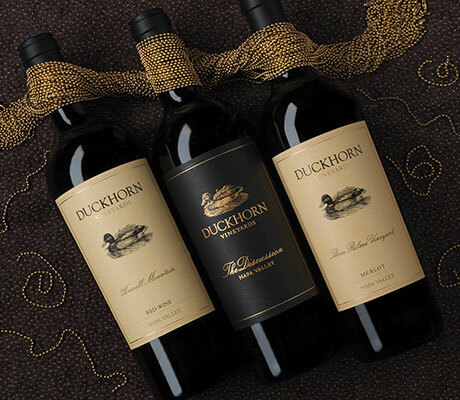 Poured out of 9.0L's we sampled a rare vertical of Duckhorn Howell Mountain Merlot from 93, 94, 95 & 96 and magnums of 08, 09, 10. Each one unique, distinctive and carrying beautifully concentrated fruit. Which one was the favorite? You'll just have to ask!! 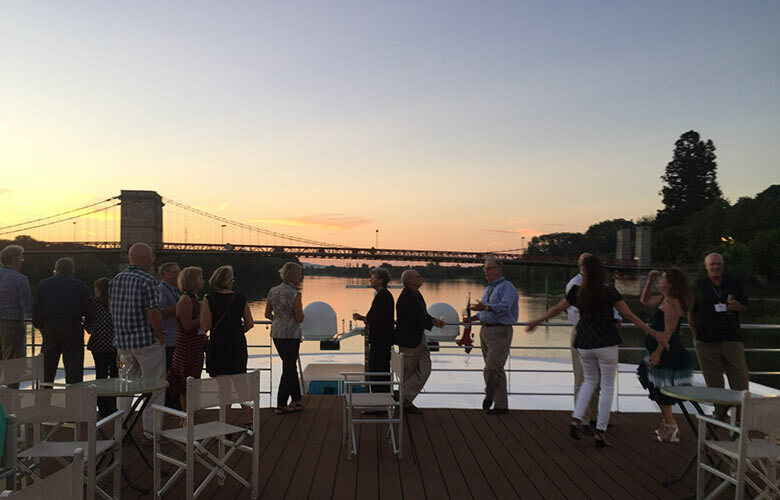 Our beautiful cruise continues on the Rhone and yesterday was in Lyon. 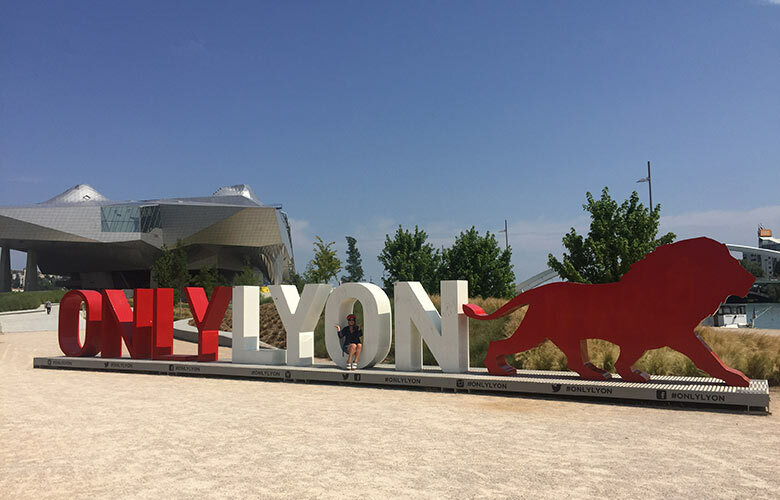 Known for its rich history in Silk Weaving and culinary restaurants alike (Lyon has over 2,000 restaurants or Bouchons as they call them), Lyon delivers on mixing the old world with the new. Here, Bouchons are small casual cafe's where you can sit for hours and meet new friends right at the table next to you, while sipping the local wine of choice - Boujalais. They say there are three rivers in Lyon, the Soane, the Rhone, and Boujalais (because of how much the locals drink it). So many sights to take in, and for a small group of us, we hopped on some bikes and were escorted through town by a local guide. As we pedaled through "old town", we soaked in the magnificent architecture including the Cathedral Saint Jean Baptiste, Abbaye de Saint Martin d'Ainay, and L'Opera House....We also learned about the many secret passage ways through town, called Les Traboules (there are over 300 in Lyon). These passage ways were built for the local Silk Weavers to take a short cut through town during rainy weather to get to the river's for exporting their goods. They also were used during WW2 for many to escape safely and in secret. These "les traboules" are open to the public, but they are also private homes and are considered premier real estate. If you are ever in Lyon, you must make sure to try a local dish called "cervelle de canut" or "silk weavers brain". Don't worry, it is actually a cow's milk cheese flavored with salt, pepper and chives and served along a light salad. This is a very popular dish in the Spring/Summer and of course a nod to the town's rich history. 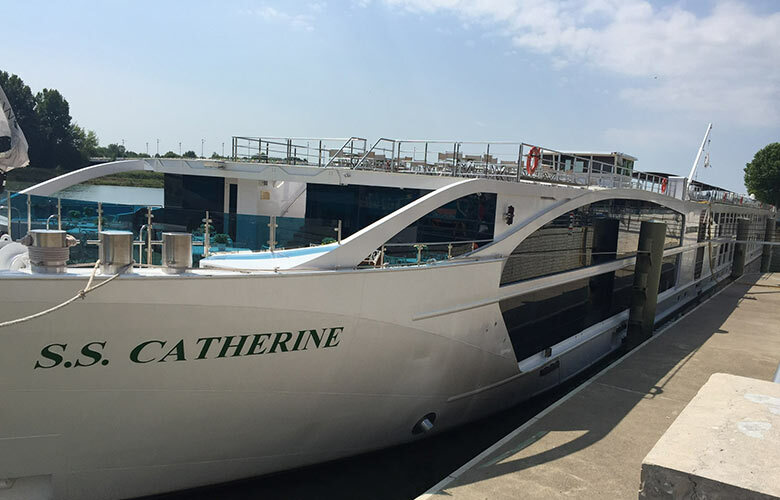 We have officially set sail for a week long Rhone River Cruise with 90 Duckhorn fans on the elegant SS Catherine of Uniworld. 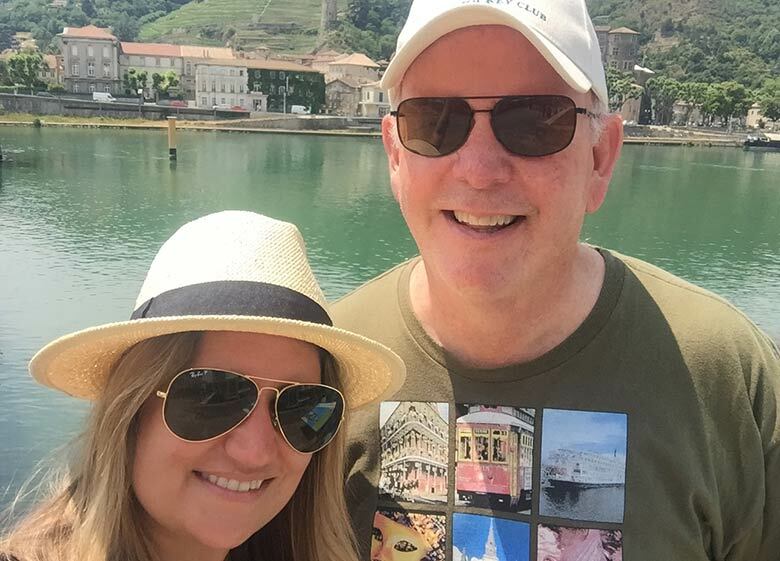 While we plan to enjoy many local wines from Burgundy, Hermitage & Chateauneuf-du-Pape, we have brought along a few bottles from home to enjoy along the way! Last night, after we settled into our cabins, we enjoyed a beautiful 5-course dinner celebrating our first night amongst new friends. It was Goldeneye's night to shine, and guests got to taste through our vineyard designate portfolio of Pinot from Confluence to Gowan Creek and The Narrows Vineyard. We, of course, couldn't forget about Ten Degrees! 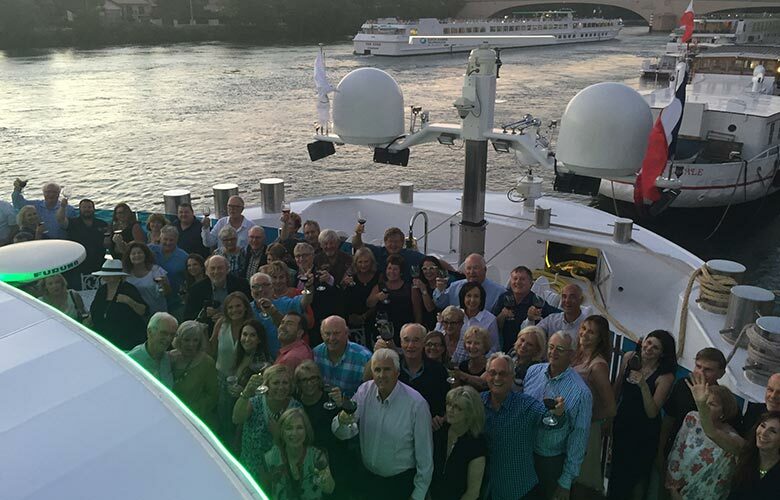 After dinner, the group watched the sunset on the ship's open top deck, as David Crum (our Wine Club & Customer Service Director) welcomed us on board with a toast of our Goldeneye Sparkling Brut Rosé. 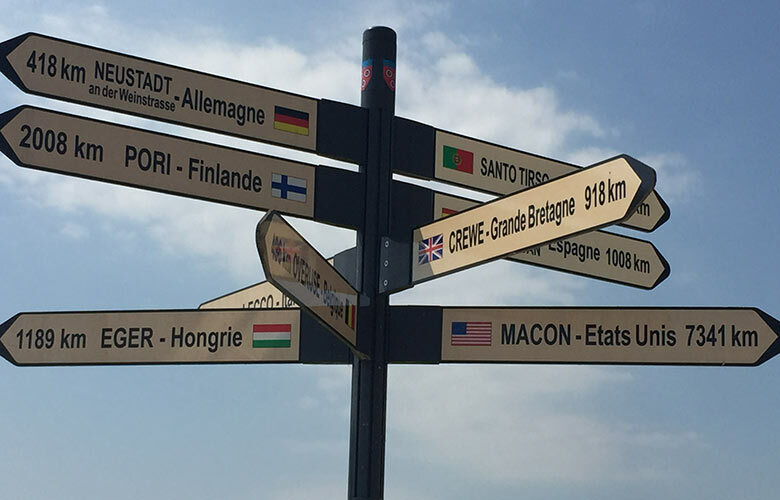 Today was our first stop in Macon (just north of Lyon) off the Saone River and is the gateway to one of Burgundy's most famous wine regions, Beaune. This small town is best known for the "Hospices de Beaune" (aka Hotel- Dieu). The hospice was founded as a charitable institution back in 1443. 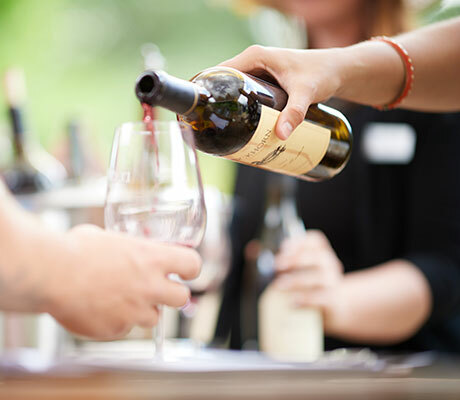 Throughout the centuries, the hospice monks were given wine and vineyards, and they began selling the wine at auction in order to support their charitable work. 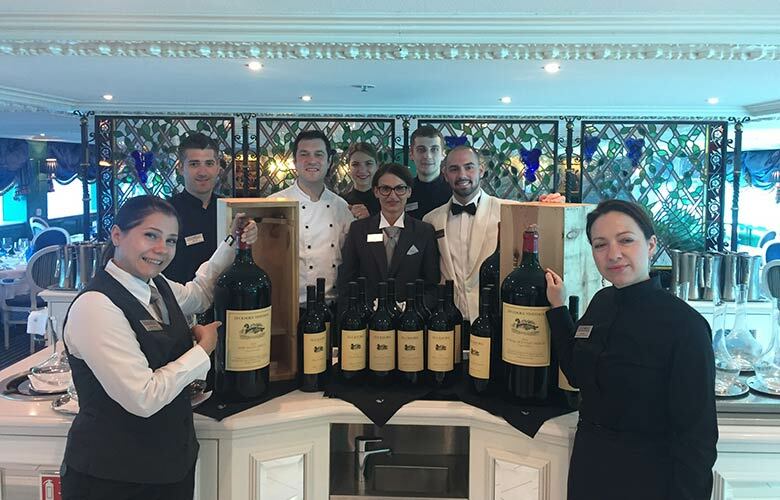 The wine auction continues to this day, and the hospice remains a working hospital for the poor. The Vineyard Team here at DWC places a lot of value in being good stewards of the land. In order to try to be as sustainable and eco friendly as we can we follow a program called Integrated Pest Management. This program is a year round system that we implement in order to have a proactive farming plan. The purpose of IPM programs are to eliminate pesticide treatments that are unnecessary, minimize risks to water and air, and to protect beneficial insects as well as pollinators. 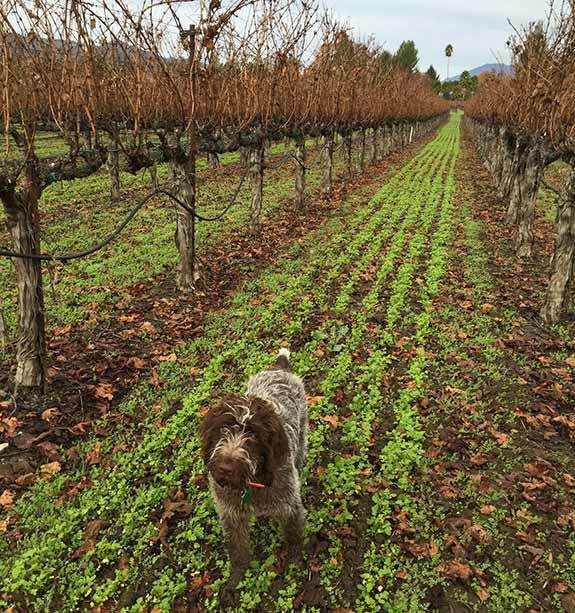 Always being educated and aware of the ecosystem around us helps us make conscience decisions for vineyard practices. Most of our vineyards have also been certified by Fish Friendly Farming. The certification itself is a rigorous process and helps us to maintain and create ideal environmental quality and habitats on private land. Long term environmental improvements and farming sustainably will help us create a better future for farming. We love our vineyards and taking good care of soil, air, plant and water mean that we can continue to grow amazing grapes year after year while also being the best environmentalists that we can be! When fermentation is complete, and we have extracted all the goodness out of the skins, it is time to press. The first important step to pressing is removing the ‘free run’ wine from the skins, so that we can then dig them out and put them in a press for squeezing. 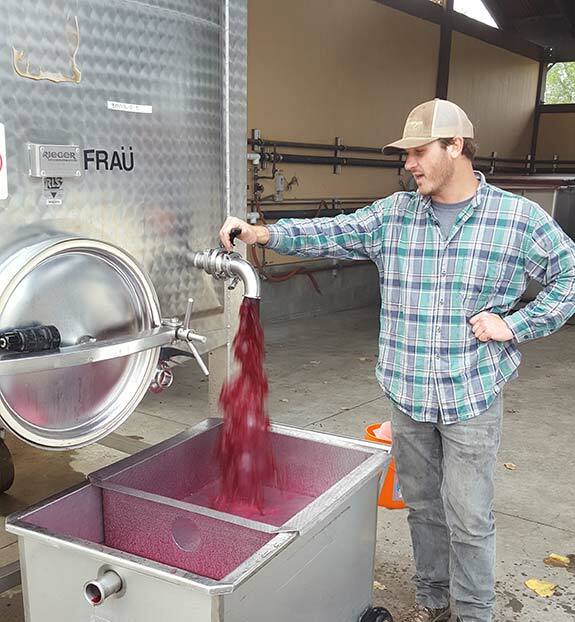 Draining a tank is one of my favorite parts of the process, as the air becomes filled with beautiful fruit aromatics, and you can finally see the incredibly vibrant color of the young wine. See the Pinot Noir waterfall below, along with Michael Accurso overseeing the process up at Goldeneye. Another incredible harvest year at Goldeneye has come to a close, with the last tons from Gowan Creek Estate vineyard coming in. Congratulations to Michael Accurso on his first harvest as head winemaker, and to his team Pancho, Stephen, Jose Luis, Remy, Denise, Shelby, and Julia on a job well done. 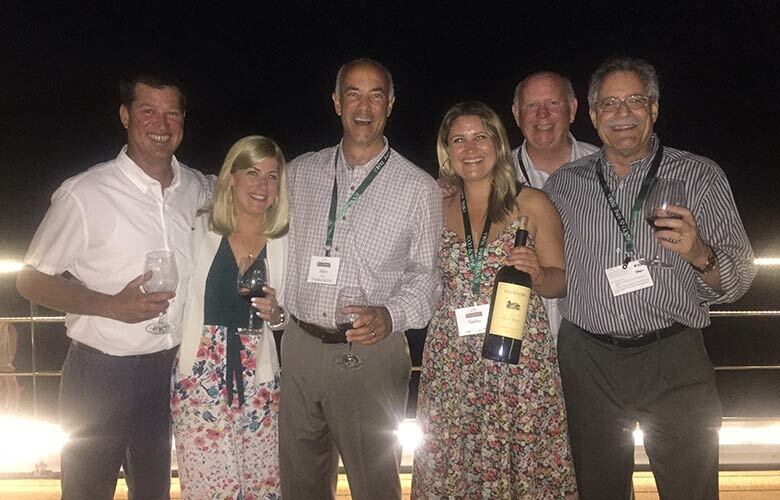 A special congratulations to PJ Alviso and the vineyard team on the successful completion of another growing season in the unique and special Anderson Valley. 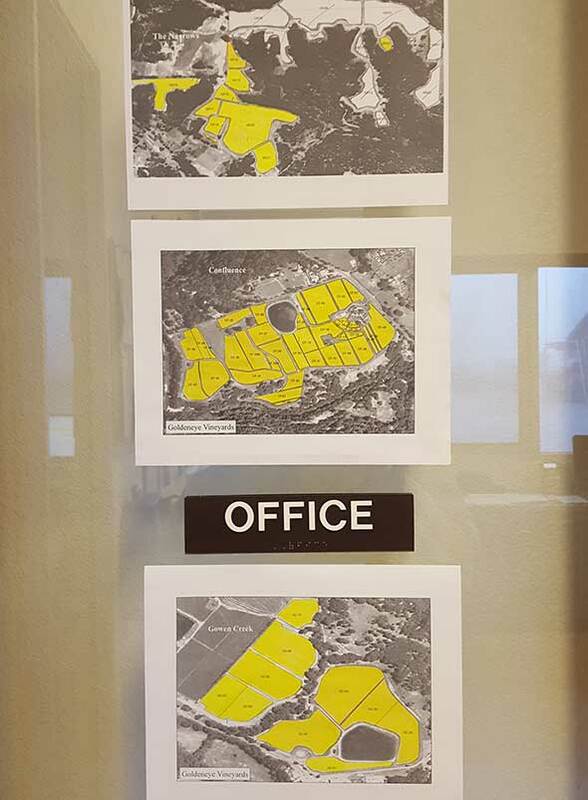 Each one of the highlighted and completed vineyard blocks below represents many hours of toil and effort. And as the vineyard journey ends, the cellar journey begins – these wines will age and mature for the next few years in barrel until they are ready for enjoyment!